A form of deep tissue massage therapy, seated massage is delivered to clients whilst fully clothed and seated upright. Not only does this make it a workplace friendly treatment, it has also been shown to have a wide range of physical and psychological benefits for employees. Seated massage, much like it’s better known table-top cousin, can alleviate the symptoms caused by muscular strains and sprains. It also helps to keep the body supple, preventing injuries that occur as a result of stiffness from being sat in the same position for a long time or from continuous repetitive movements (often known as repetitive strain injury). As well as treating and preventing physical complaints, massage can help to reduce stress levels and provide relief from the symptoms of other common psychological conditions such as anxiety and depression. The mental wellbeing of staff is just as important as their physical wellbeing; healthy staff, both physically and mentally, are happier staff and happier staff are more productive. 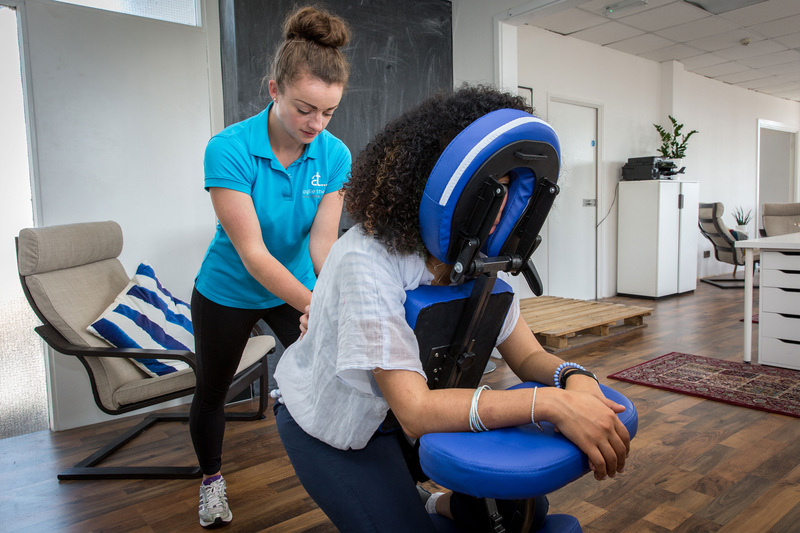 Because of its wide-ranging benefits, seated massage is becoming increasingly popular within workplaces. It can help to prevent sickness absence, reduce working time lost to medical appointments as well as increasing the productivity of your staff. Our seated massage is delivered by fully qualified Sports Massage Therapists who have extensive experience in treating a variety of muscular injuries. Find out more about how massage can help ease the strain that absence puts on your bottom line.